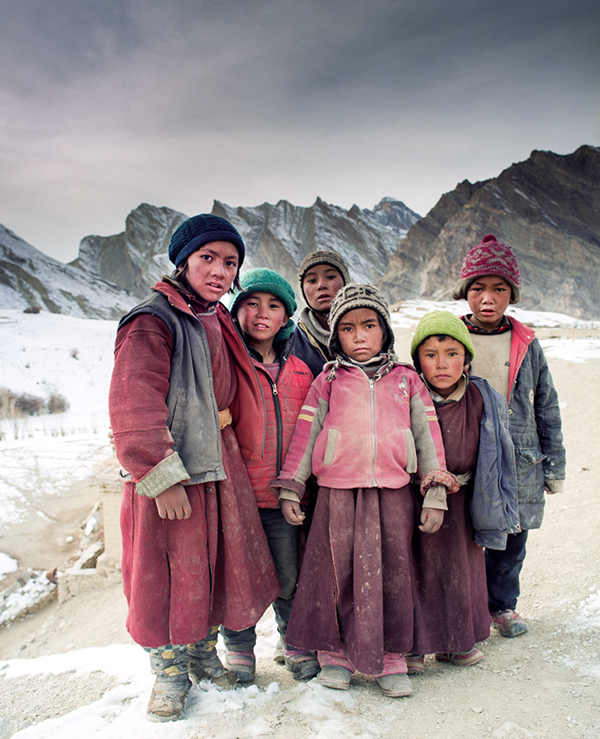 I have always been fascinated with the hardy people of the Himalayas and their ability to battle some of the harshest winters on the planet. Paradoxically, the cold winter only seemed to make the people warmer in their care and hospitality. Picking up the camera for shooting was very often the last item on the agenda. It was more important for me to find out how they lived and how they beat the winter. I told them where I came from, what I did and what I was hoping to achieve. They, in return, told me what they did, how crazy I was to have turned up in winter and what they hoped to achieve in life as well. So, rather than pointing my camera at every person and opportunity, I took a much slower approach to photographing the subjects during this trip. Most photographs, barring a few, were taken after getting to know the person, his or her lifestyle and profession and also some of the person’s family members. He woke up at 4:30am to light a fire under his car’s fuel tank to melt the fuel so his engine could start. And reached 15 minutes late at 6:15am thanks to the resurrection of the engine. I can’t blame him. We went to Stakna (Tiger nose) monastery, belonging to the Drugpa sect of buddhist monks. This is what it looks like at sunrise. The temperature was a frigid -20C but water continued to exist in three states, ice on the mountains, liquid water flowing in the river and mist of water rising near the foliage. 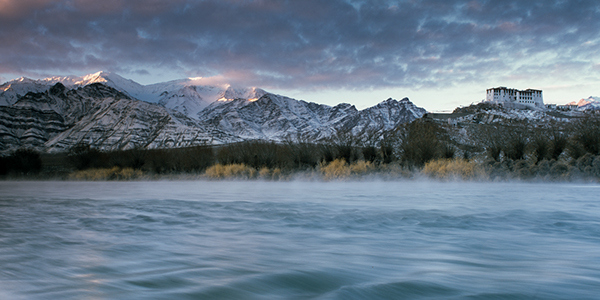 Sunrise in the mountains is always a tricky affair as the light changes very rapidly and the mountains’ jagged peaks make it difficult for filters to be mounted. This was the sunrise at Shey, near Leh, Ladakh. Buddhist prayer flags a very common sight in the Himalayas stretching from India to the Tibetan Plateau in the north, to Nepal, Bhutan and Arunachal Pradesh in the southern part of the Himalayas. They are generally coloured in red, green, blue, yellow and white. 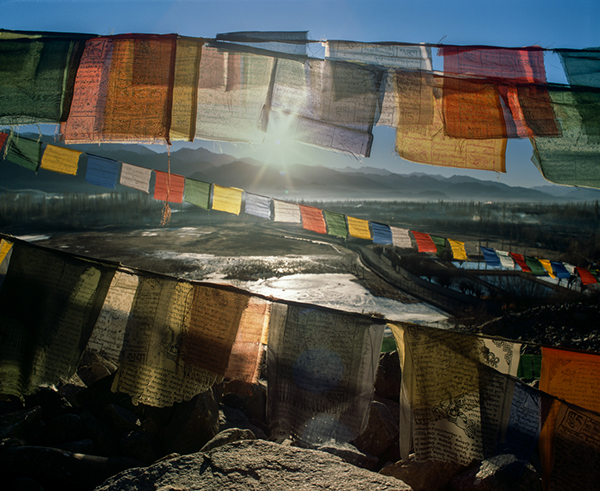 Written in Tibetan and bearing messages of peace and compassion, the wind is believed blow through these flags and spread the messages. While it was nice to see dash of bright colours in an otherwise arid land, the wind blowing the messages could have been warmer. I trekked through the Zanskar river which freezes (well almost) in winter allowing people to access the city of Leh from remote villages in Zanskar. 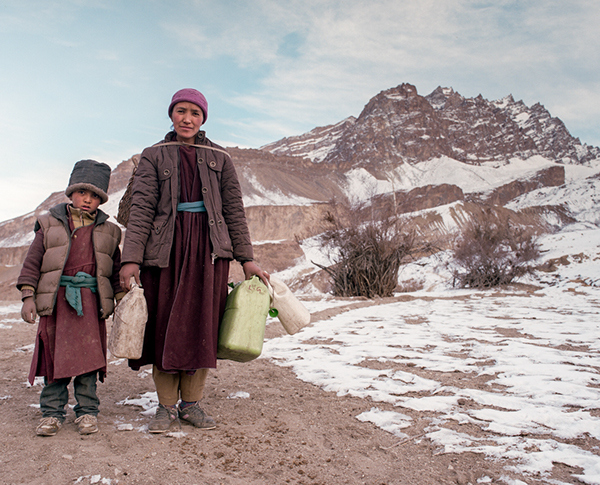 In the past this was a lifeline for the people of Zanskar who would walk for weeks just to be able to send their children to the boarding schools and gather supplies for the frigid winter. 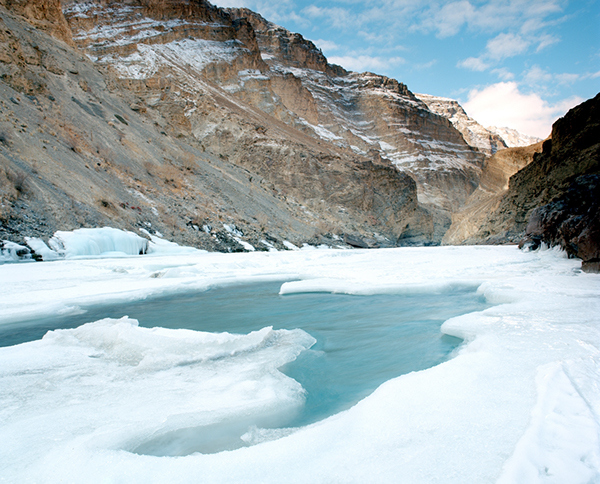 The arduous trek is called the “Chadar” which literally translates to blanket, referring to the ice that almost completely envelopes the river. Contrary to popular thought, the ice does not fully cover the river and in many places you see the river overpowering the ice with its sheer force resulting in varieties of ice of diverse texture and hardness. The locals from Zanskar make it look like a walk in the park but many trekkers turn back half way owing to the bitter winter and the possibility of having to wade through knee deep water in freezing temperatures. During my trek, we drank the water directly from the river but if the littering continues at this pace, it is unlikely the water will be potable in a few years. Furthermore, big tour groups damage the area with the chopping of firewood for fuel and heating. Almost all the vegetation in the area has disappeared. What used to be a trek of necessity has become a trek for fame and selfies in this beautifully remote area. I am ashamed to be part of this mass of human invaders in this beautiful land. 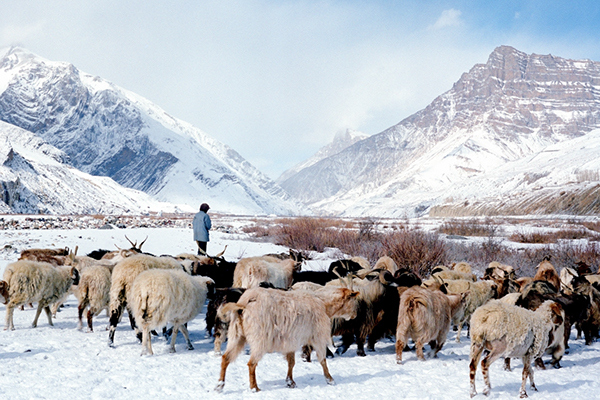 Most people who walk the Chadar, end their trek here at Nyrak Pulu. 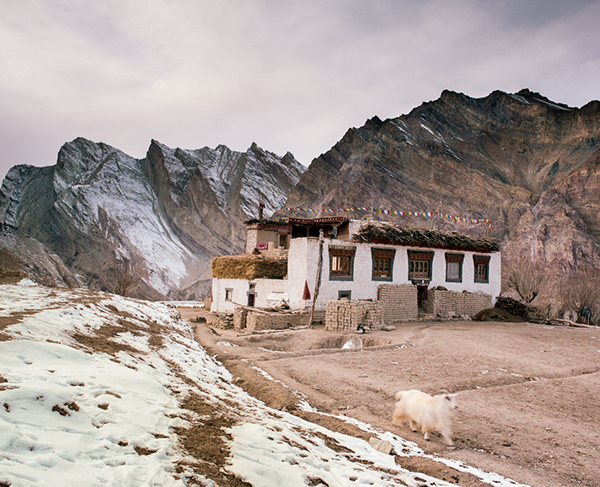 This village is the gateway to Zanskar and a good resting point before trekkers turn back for the return journey. I however, went deep into Zanskar which was an additional day of trekking followed by a road trip to the village of Zangla. 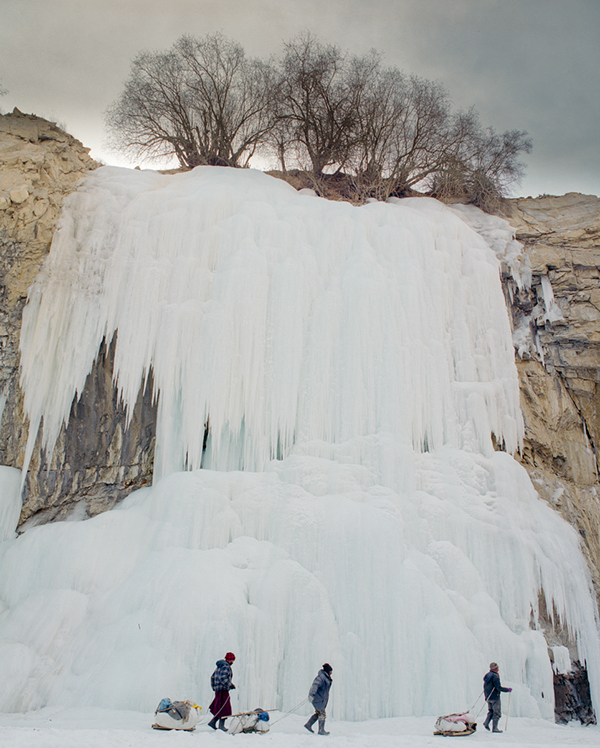 The waterfall freezes over completely in winter and makes for an impressive background against which most tourists shoot their selfies. While most people like to shoot waterfalls with silky smooth texture by dragging the camera’s shutter speed, this waterfall can only be photographed with the motion frozen. It was a well deserved rest after four days of trekking in a “hotel room” that comprised just one stove and two windows. No lights, or any other electrical appliance. I appreciated electricity a lot more after the stay at that hotel. From here we had to climb up a good 500m or so of sleep slopes to get to Nyrak village to access the only fixed phone line that would connect us with the people in Zanskar. They put a phone connecting this village to the rest of India (not the world, I couldn’t call Singapore and neither could my relatives call me on that line) so the entire village spoke to other villages in Zanskar (who also had just one fixed phone for the whole village). Here is how it worked. We climb up to the phone booth in Nyrak village and make a phone call to a driver in Zangla village in Zanskar who will bring his car to the next stop (Charakdo) on the afternoon of the following day. Otherwise we just hang out with the construction workers who have built a road from the other side up to Charakdo. So here we were, making a call from above 3,800m altitude to a driver who is hopefully at his house so someone from the phone office can inform him of our arrival. Fortunately, the message went through. 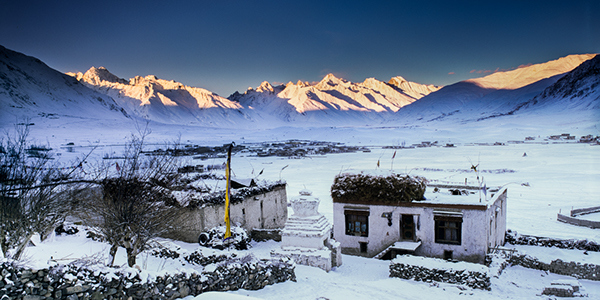 The winter in the remote Spiti Valley of India is very similar to that in Ladakh. 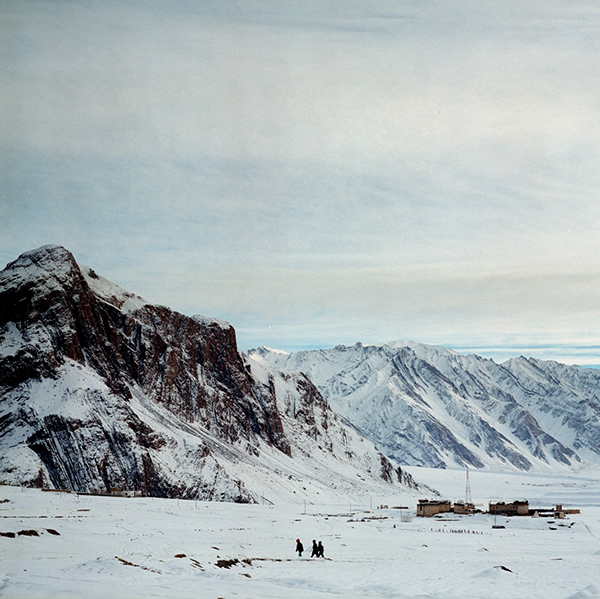 People are generally staying at home and only leave the warmth of their houses for essential activities. Certain activities are perennial and can’t be stopped in winter. Bringing the livestock for grazing is one of them. I could not talk to this shepherd because he kept walking with the sheep most of the time. But I saw him on two days at the same times. The temperatures were well in the below -20C, but he would be outdoors for four to five hours waiting for the sheep to finish grazing. I can understand why he kept walking because it was quite difficult to stay at one place and stop yourself from freezing. I only chased him for around five minutes before heading to the near frozen river to shoot some landscapes. On my way back in the late afternoon, he was still in the area walking around. He is completely covered up from head to toe (including his face and eyes) and I knew why. When the wind blew, it felt like a knife was cutting through my face. Although they are locked in for the winter (because of the weather, not culture), women undertake quite a few activities that keep them occupied during the cold months. Weaving is by far the most popular activity with anything from sweaters to blankets being woven over a period of a few weeks. 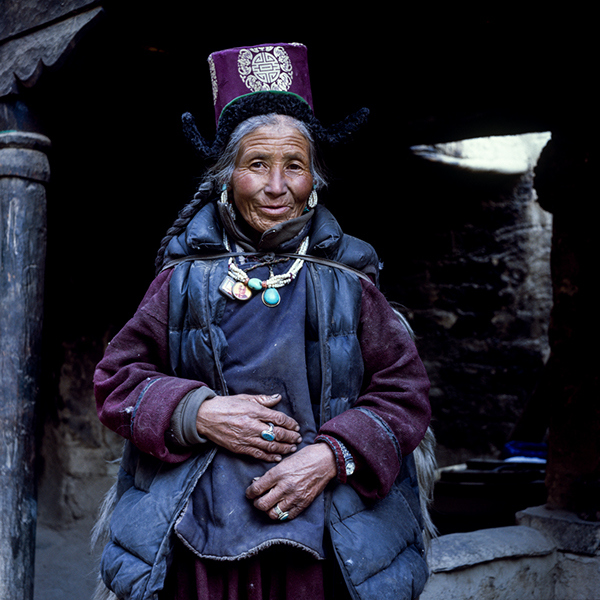 The woman photographed here is the wife of one of the cooks who trekked with me on the Chadar. She is weaving the wool from her sheep and goats to make a shawl (shown in the next picture). The wool comes in tangled balls and the first step involves straightening them out using the tools she is holding. This is from what I gathered from her (she spoke very little Hindi and no English). It is then spun into a yarn then used for weaving the shawls and blankets. She also owned two cows and I tasted milk for the first time in a few weeks (it is a privilege to drink fresh milk in this part of the world as not many people have cows at home). Non-pasteurised and non-homogenised but thoroughly refreshing. Another activity carried out by both men and women is the chanting of buddhist mantras with beads and prayer wheels. Three generations of the family live under the same roof and the older folks generally spend their days chanting “Aum Mani Padme Hum” which translates loosely to “bestow the precious jewel of enlightenment to liberate all living beings” (one of the many translations available). 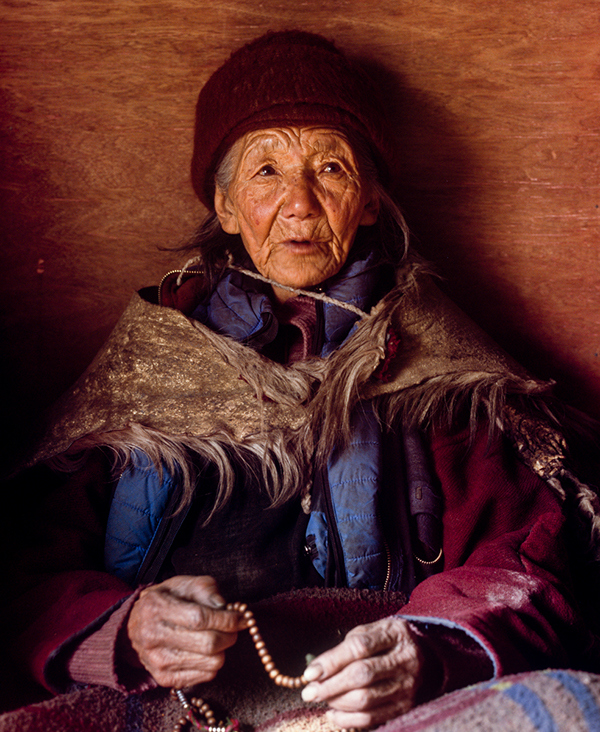 This lady spoke only Ladakhi so it was difficult communicating with her. But she did say the shawl she is wearing took a week to make and it is made of both goat and sheep wool. The older generation are generally more camera shy as they feel they have grown too old to be photographed. But the family of this lady convinced her to have a picture taken. I stayed with them for a day and it was great watching three generations of family members interacting with one another. The kids especially had a great time playing with grandparents during “office hours” and with their parents after “office hours” when the father returned from work. Fetching water is another activity that is done throughout the year for obvious reasons. Children as young as seven carry 10-15 litres of water from hand pumps scattered around the village. In winter only a few pumps work (the rest freeze over) and often the journey for water can be as long as a kilometre from their houses involving steep climbs in this village. The river is almost 500 metres below so in the event all the ground water freezes they do climb down to the river to bring up the water. I met this lady and her son on my way back from the village phone and the light was fading fast. Both myself and the lady were rushing as we both had to be back at our “houses” before dark. They were however very cooperative and the lady let her son stay back for a few more portraits. She asked us to wait while they brought the water so they could prepare tea for us before our downward journey. I was hesitant but my guide told me it would be very rude if we refused because the lady was born and brought up in the same village as my guide (Zangla) and it was almost four years since they met. So I went in for tea and rushed back in a race against the sun to make it back to my room just at the onset of dusk. Thanks to my guide’s thorough knowledge of the area, I made it back safe and sound in spite of the darkness. Flat roofs and mud walls are what most houses used to be made of in this part of world. The materials were sourced from local villages and timber was used mainly in the doorways, windows and to hold up the roof. However with “modernisation” many of the traditional houses are being replaced with cement and concrete which has not been able to hold up with the challenging weather. The traditional houses, like the one photographed here had thick mud walls that insulated the interiors and kept the inhabitants warm. Concrete however requires metal reinforcements and generally does not insulate the interiors from the cold outside. But architects and masons who design and build the traditional houses are also getting scarce so I foresee this becoming a problem in future. While many Ladakhis (at least those who can afford to) stay at warmer locations and lower altitudes during winter, a significant proportion of the population stay and battle it out with the weather in winter. To keep warm, all the members of the house live inside one room that is heated throughout the day with a wood fired stove that almost always has a pot of water getting heated. The poorer families usually burn dried cow dung or wood shavings which, although combustable, doesn’t burn quite as long as wood blocks hence requiring constant replenishment. I stayed in both the wood-fired and the cow dung-fired houses and found the former more comfortable. Regardless, waking up in the morning to get the fire going is an exercise of utmost torture and I have nothing but respect for these families that do this for six months in a year. The elementary school in Zangla village is just a room. No chairs (except the one used by the teacher) and no lights (just a big glass wall to let in sunlight). School carries on as per normal in summer and winter. I think this would be the best scene to walk through on the way to school. In the past any education beyond primary school was only possible in Leh and the kids would be sent to boarding school after their primary education was complete. Today they can study up to secondary and junior college level in their village. So some progress has occurred over the years. This school had 25 kids and two teachers. The kids gave the broadest smiles when I passed them pens, pencils and crayons. The teacher then made them bow and say thank you in unison. It was very awkward to be thanked so profusely for something so small. But this is a world where pencils are sharpened and used till they are no bigger than half a human thumb. The two teachers who work here said there were some kids that did not have writing materials of any kind (books and pencils) and asked if I could send some with the guide when I return to Leh. I readily agreed and made it a point to pass the guide an additional 10 packs of crayons, pencils and notebooks so he could bring it back with him when he went home. In a world where most people ask for money and donations in cash, here I could still find people asking things that could be of benefit for their kids. I asked if the teachers needed anything for themselves and they politely declined. Unlike kids in cities that have plenty of entertainment sources, the kids in these villages play outside after school until the sun sets. Running around or cruising along on home-made skis, they are very active and even the thin air at this altitude is unable to prevent them from chasing each other on steep slopes. At Nyraks village, I went looking for some foreground subjects for framing the mountains against. The Sun was setting soon so time was scarce. It was then that the kids in the pictures looked at my enormous camera (RB67 with a 50mm lens and grad filters mounted) and thought I was making a movie. I asked them to stand where they are and took this photo. They say the best photos are the ones we record with our eyes and minds and this was one of those moments I wish I had captured on film. One of the kids (the second from the right) got a bit curious and came a little closer to see me shooting. I asked him to look through the viewfinder (it has a waist-level finder so people look into it much like a flip up screen on modern digital cameras) and he let out a shriek of joy when he saw everyone through the lens. For some strange reason he laughed and brought all his friends (in this picture) to see it and they were all really amused at the lateral inversion. A handout of chewing gum had them shrieking in delight. People here were definitely way happier with a lot lesser. Those kids that do not attend the village primary school end up at the monastery. The weaving lady you saw earlier also sent one of her kids to the monastery to become a monk. Sometimes, parents are unable to bring up the kids due to their economic difficulties. 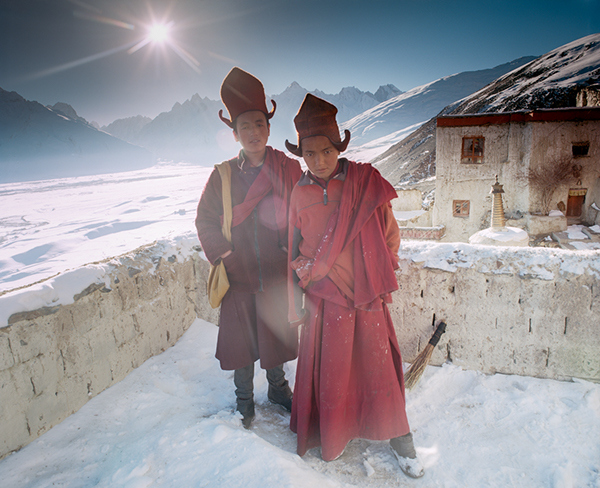 The kids are looked after, fed and educated in monasteries where they train to become monks. These are the kids who stay at Karsha monastery. An elderly monk saw me and my guide clearing the snow on the roof of one of the buildings so I could pitch my tripod for sunset. He immediately sent two kids up to help us with it. They really did not have to help us but just the sight of anyone appearing even slightly inconvenienced seems to affect the people here. The two kids came up and asked me to pass them the broom I was using (seen on the right of the image). I told them there was no need for it anymore but if they did like to help they can hang around and have a chat. I found out a bit more about them and finally asked if I could take a photo of them. And this was the resulting image. The one on the right was curious and asked me where he should be looking because he saw me looking downwards into my viewfinder. Detecting a bit of haste in his voice after the picture was taken, my guide asked him if he was rushing for another lesson and he said, “No, it’s dinner time and they’re cooking Paduk today!” Paduk is a local soup based food made from rice flour. The monastery belongs to the Gelugpa sect characterised by their uniquely shaped hats. Kids who stay and study here, however, do get to decide on their career paths after they turn 20 years of age. They can choose to work in the outside world and get married or stay on to become monks. The monastery does prepare them adequately in the general academic syllabus as taught in regular schools in the area. 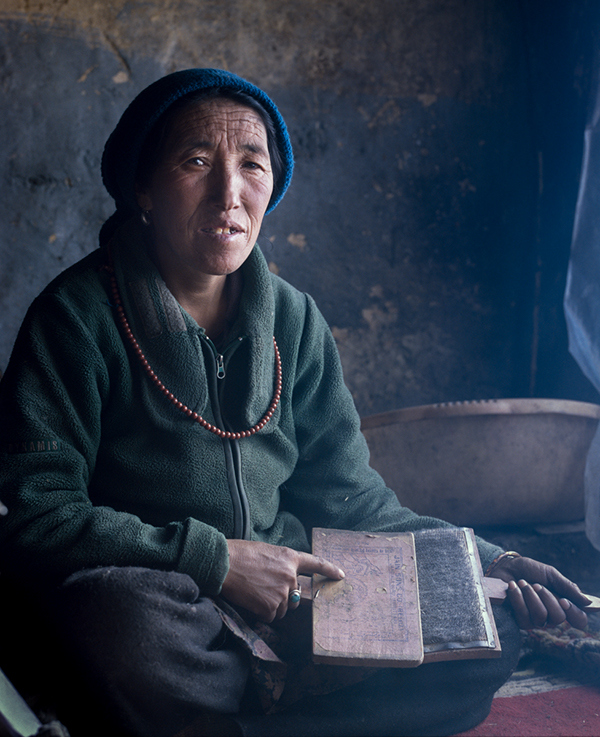 Perhaps the most painful shot taken on the trek was of this monk at Stongdey Monastery. It was mentally, physically and technically challenging. The first thing he said upon hearing I came from Singapore and Bombay was ,“So what you are doing here in winter, committing suicide?” I laughed uneasily not expecting such a welcome from a man of his profession. But I judged him too fast. I had to remove my shoes to enter his room. And that made the physical problems worse. The feet began to freeze and I had to keep moving my toes to feel their existence. The mental challenge was fortunately limited to my mind trying to stay warm to process thoughts and trying to get over the unorthodox welcome from the monk. Then the technical challenges began. Light streamed in from a little window on the monk’s right. Initial attempts to record the monks prayer ceremony failed miserably even on an ISO 3200 film. Just too little light for any action shots. 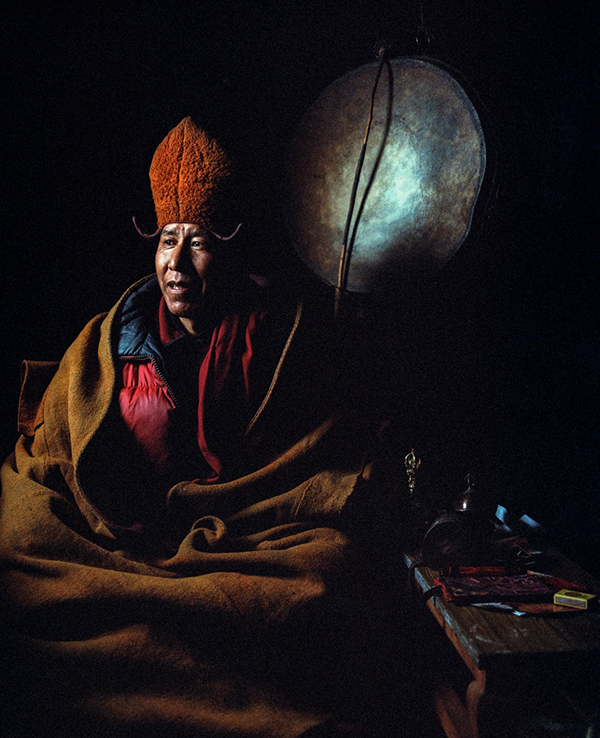 The one-foot-by-one-foot window lighted up the monk with the drum in the background. The shutter speed was two seconds at an ISO of 1600 and an aperture of f/5.6. But the monk stayed still and held a natural smile. After the shot, the monk invited me to the monastery’s kitchen and offered tea and biscuits and told me to be careful of the cold as he felt I was too skimpily dressed for the winter. I thanked him for everything and made my way down. Being snowed in that day at Stongdey village, meant we could not reach my guide’s village for the night. We stayed at one of the houses in Stongdey village for the night hoping for better weather the next day. I woke up at around 6:30am following morning and went to the window. The view was completely obscured by accumulated ice on the window. So the driver opened up one of the windows and said the scene outside looks very pretty. He could not have been more correct. I took one glance and ran back to my belongings. Took out my two jackets, two pairs of socks, beanie and two pairs of gloves and wore everything in a rush (it’s annoying to put on so much clothes when the light outside is changing every second). I picked up my camera bag and tripod, running out and almost slipping and falling down the stairs outside the house. Cursing for not having scouted a location the previous evening, I hastily set up tripod, camera and took a reading to fire a few frames. The shot here is one of those frames that turned out fine. Wasn’t too happy with the location and composition but satisfied to have managed to capture the morning light in the mountains. Then the cold began its assault. The nose began to drip but the mucus froze the moment it left my nose. So I had frozen mucus droplets on my jacket and on the camera as well. It was easy chipping it off the camera body (the RB 67 is made of solid matte finished metal so the mucous does not adhere to it well) but then the droplets on the jacket were difficult to find. I had to get rid of them before I entered a house because it would melt under the warmth of the fire. I will spare you further details. Working at dawn or dusk at altitudes at or above 3,000m is particularly difficult as the light changes very rapidly and within moments the warm light of the sun becomes harsh and strong. And waking up before sunrise meant having to put on extra layers of clothes to protect oneself from the bone freezing environment outdoors. After my trek ended, I returned to Leh only to find a landscape that was starkly opposite to the endless spread of white I saw in Zanskar. I was hoping it would have snowed in Leh during my trek but everyone was saying this was the warmest and driest winter they have seen for many years (by warm they meant -10-15C). 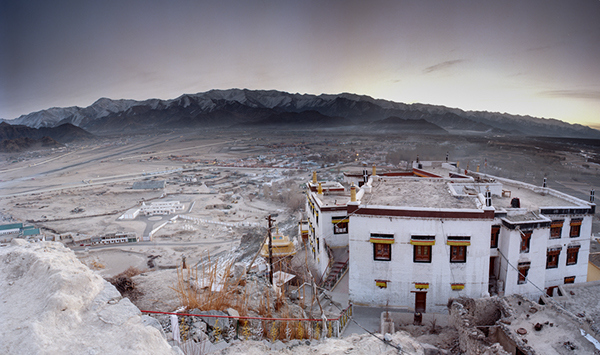 I made my way to Spituk Monastery early in the morning to shoot the Spituk Gustor Festival (the lunar new year). This was one of the first photos I took on my last day of shooting and here you see the monastery on the right and runway of Leh Airport on the left. Dry and hot as this place looks, it was anything but. The cold wind continued its affection for me and kept kissing my face with its thorny lips. But the view of aircraft coming in to land (both military and civilian) together with a steady stream of people making a beeline for this monastery was a very impressive sight first thing in the morning. It was an extremely disappointing day from here on as you would find out in the last photo. The last photo, perhaps summarises exactly how badly this trip ended from an absolutely wonderful beginning. I was back from the trek, I was looking forward to going to the lunar new year celebration at Spituk Monastery, a few kilometres from Leh. I was one of the first to arrive and I sat down comfortably with the locals and sipped some hot tea. Then came the other photographers. In their dozens and with tripods and frighteningly big lenses. The festival started at around 9:30am and by that time there were more photographers than participants of the ceremony. It was almost impossible to get a shot without another photographer in the background. So I did all the photographers a big favour. I left the place after this last photograph of the drummer and his well worn hands. The rest could now shoot with one less photographer polluting their photos. All in all I only shot around half a roll of film. In some ways this very last photo felt like it was a good conclusion to a long journey. 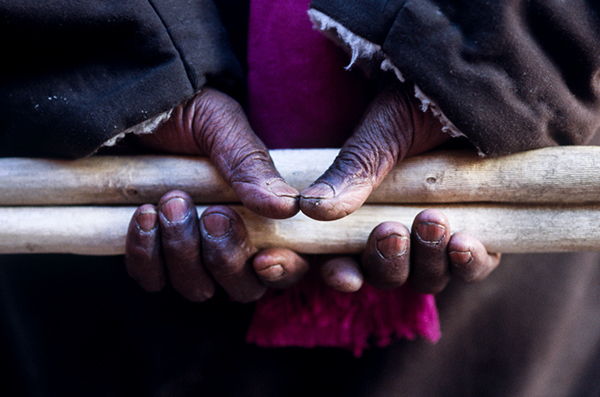 The people in the mountains hardly wear gloves, displaying their rugged hands with scars from all the hard work needed for survival in this hostile land. But their warm hearts, unimaginable hospitality and willingness to help somehow seems incongruent with their physical scars. In paintings, angels always seem to be painted without scars or flaws but in reality they have borne the scars of many good deeds. Especially when those good deeds were done for the benefit of random strangers like myself. They opened their houses to me when I was cold, lit up their stoves for feeding me when I was hungry and carried my burden when I felt weak. My hands were tired as well from all the climbing, shooting and carrying. That, possibly, was the only commonality I shared with the wonderful mountain people. I put away my camera and walked away with my hands behind my back just like this drummer – except I was fatigued and fed-up. All photos are copyright Nandakumar Narasimhan and are not to be republished without his express permission. You can see more of his pictures at 500px.com/nandman83 and sign up for a photography workshop at Phocus Academy.